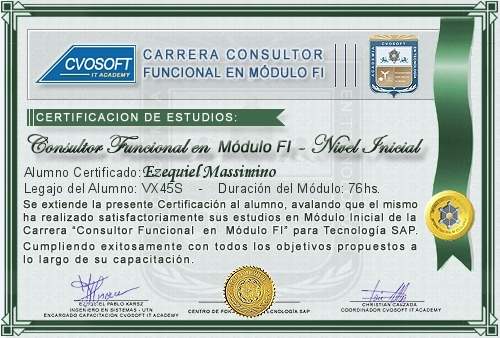 Ezequiel Massimino ha alcanzado la certificacion que a continuación se detalla. · Analyze old functionalities, implement and give advice on new improvements to be implemented for a local online stock market trading web based platform, developed by Puente. · Advice individual investors on how to use the new improvements on the online platform in order to maximize returns. · Advice IT Department on new functionalities to be implemented in CRM software in order to fine-tune client services (i.e. : Improve data-collection, portfolio management and client feedback). · Functional consultant in the implementation of the AM module. · Created and Succesfully implemented data conversion plan. · Security Set Up and Structure design implementation. · Post Go-Live Production Support for AM. · Lead functional consultant in the implementation of the AM module for newly created BU. · AM Module post production support for end users. · AP Module post production support for end users. · Succesfully develop nVision reports. · AM Data Extraction and Migration Plan (Analysis, Functional Support on Design of SQR Extraction/Migration Program, Field Mapping). · Functional support on new customizations (PO, AP, IN and eProcurement Modules), Design and Development of end user guides for CCU Chile S.A. using User Productivity Kit (UPK) Tool. · Lead Functional Consultant for Project Costing and Asset Management Modules Implementation. · Post Go-Live Production Support for AM, PC, GL and AP modules. · Support on FIT/GAP analysis for Spro. · Performing training material and user guide for final users. · Implementation Team Member as shadow for Functional Leader (AR, AP, PO). · Planned system quality assurance and UAT. · Develop and test nVision reports. · Functional Support of PS Financials v8.0 (Arg. Localization) for AP, PO, GL and AM applications. · Implementation Team Support SAT CRM/ERM 8.9. México. · FIT/GAP Analysis and Documents. Tras completar el siguiente formulario, la información proporcionada en el mismo será enviada de manera inmediata vía correo electrónico a Ezequiel Massimino. como primer comentario me gustaria decir que encontre todo muy bien organizado, las respuestas del instructor siempre a tiempo y dejando la sensacion, basandome en los hechos, de que esta siempre atras de los estudiantes y eso me parece excelente. Solo felicitarlos por seguir mejorando y dar estas oportunidades a estudiantes nuevos. Aun me queda la segunda parte del curso y seguramente pueda disfrutarla como lo hice con la primera parte.